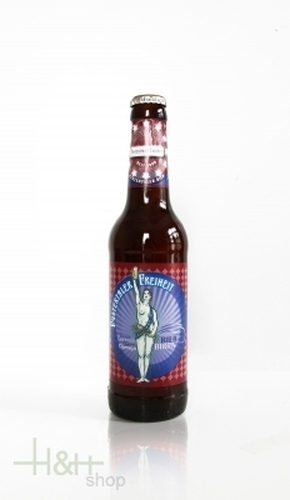 Red Beer Pustertaler Freiheit 330 ml. Buy now this product together with Beer Pustertaler Freiheit 330 ml. ready for shipment: in stock Beer Pustertaler Freiheit 330 ml. Our Wheat Beer (weizen) is a top fermented beer made with a mix of barley and wheat malts. The wheat ensures intense scents along with especial aromatic sensations. The beer head is fine-grained and persistent, the brew presents a yellow colour with tangerine hues. The first 100% Italian beer made with Italian ingredients. An intentionally simple beer: Italian water, barley malt, hops, yeasts and two Italian spices (bergamot and coriander) which combine to create harmony and originality. A beer which suggests more or less daring combinations, but more importantly marks a turning point in the Italian production of craft beer. Nazionale, is excellent as an aperitif and goes well with any dish. The creamy head, the intentionally cloudy, apricot color and the scent of yeast and citrus, which blend into spicy harmonies of coriander and peeled oranges, call you the glass. Refreshing to the palate, it has a light body and is very easy to drink. Super takes inspiration Abbey beers and interprets them with its own style. It has a gleaming amber color and smells of tropical fruit, banana and marzipan. Super is harmony turned into beer and leaves an aftertaste of dried fruit and almonds. Easy to drink and well balanced, it is the ideal accompaniment to food and is perfect to sip in the company of friends. Red Beer Double Malt 750 ml. - Birra Menabrea S.p.a.
Beer Pustertaler Freiheit 330 ml. 2,25 EUR / 6,82 €/lt. Beer Forst Kronen tin 24 x 330 ml. 33,95 EUR / 4,29 €/lt. Lager Beer Pustertaler Freiheit 330 ml. 2,25 EUR / 6,82 €/lt. Antonius Weizen 33 cl. - Antonius Bier 2,25 EUR / 6,82 €/lt. Antonius Cellar Beer Zwickl 33 cl. - Antonius Bier 2,25 EUR / 6,82 €/lt. Antonius Blond 33 cl. - Antonius Bier 2,25 EUR / 6,82 €/lt.